1 MELT margarine in large nonstick skillet over medium-high heat and cook onion, stirring occasionally, until tender and caramelized, about 7 minutes. Remove onion from skillet; set aside. 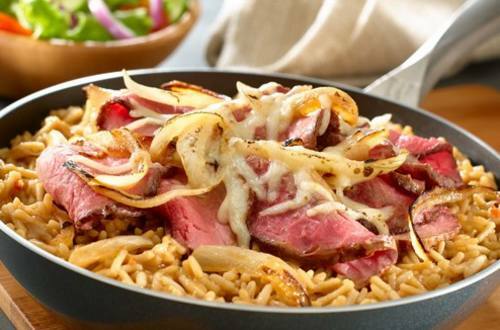 2 STIR Knorr® Rice Sides™ - Beef flavor and water into same skillet and cook covered 7 minutes or until rice is tender. 3 TOP rice with 1/2 of the onion, roast beef, remaining onion, then cheese. Cook covered until cheese is melted, about 2 minutes; now it's delicious. Dig in!